And honestly, my CT Classic Diners section is a bit of an afterthought ‘round these parts. But as these historic buildings and businesses continue to fall by the wayside, I have renewed interest in getting to as many as I can before they are all gone. And of those left, the Aero is certainly one to treasure. First of all, it’s beautiful. 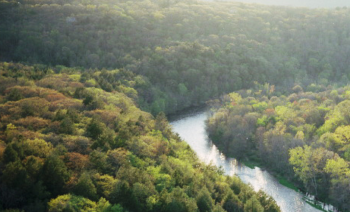 Really and truly – I’d say that it, along with the Collins Diner in North Canaan (CTMQ Visit here), it’s the most attractive from the street. But inside! Inside the Aero you are transported to a hip, artistic, mid-century beaut. Despite having just woken up at 5:30 and driven in from Cape Cod with my tired and vacation-weary family, we all immediately perked up upon seeing the bright orange booths and happy servers. It helped that the bathrooms are huge and bright. This Diner is a 1958 “Bramson”, manufactured by the Bramson Engineering Co., Oyster Bay, New York. The American dining car history started in 1872 in Providence, Rhode Island. Over time the industry and demand for diners expanded, especially in the northeast. The design and construction matured from a horse drawn cart to the modern stainless steel structure that we have today. 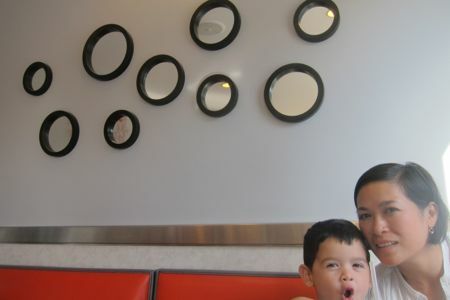 The American diner became a popular family restaurant featuring a modern, well lit dining experience with extended hours and good food at a reasonable price. This is one of only two diners ever built by Bramson, a manufacturer of hospital equipment. The fate of its twin is unknown. The diner was originally sold to Mr. Leo Adamik of East Hartford and was operated as the Boulevard Diner in the early 1960’s. 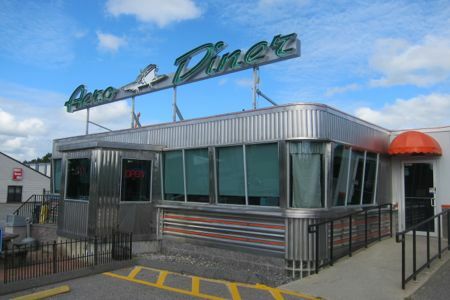 With redevelopment of Connecticut Boulevard, the diner was sold and moved briefly to Southbury, CT and then to Route 32 in South Windham. It was successfully operated as the South Windham Diner until 1995. Unfortunately, the diner then sat unused for a number of years; finally being donated to the American Diner Museum and then being offered for sale. It was purchased by the current owners in February, 2005 and shortly thereafter moved to the present location. Although the diner was in reasonable condition at the time of its most recent move, it still required a tremendous amount of restoration and the construction of a new kitchen. The manufacturer’s 1958 advertisement claims that the “Bramson is built like a battleship” and, like a battleship, it leaked rainwater in from every imaginable spot! Although there is no instruction book on how to restore a 50’s diner, every effort was made in the restoration to return it to its original condition. 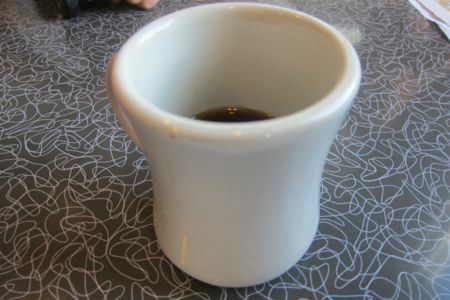 We ordered our food; typical diner breakfast fare for all of us, and I remarked on the tabletops. I like modern art, and these reminded me of Brice Marden’s work. Let’s hope the food was as good as the interior decorating of this place. I got a couple eggs and toast, having already eaten earlier. Calvin got a giant waffle, having already eaten earlier. 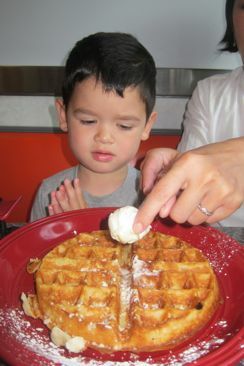 (The boy likes his waffles.) Hoang got some sort of omelette, not having eaten earlier and Damian got something or other. I forget. Our service was quick (I think it helps to have a rambunctious three-year-old to get the food made quickly) and we cleaned our plates. That’s really the best one can hope for at a diner, right? Right. 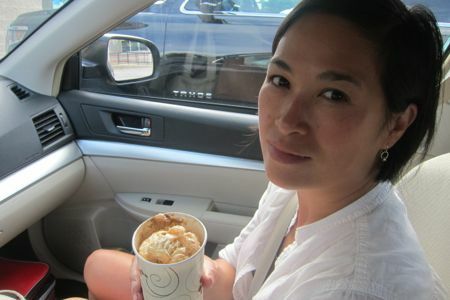 On the way out I asked for a root beer float to go. Of course that’s a stupid item to take to-go, but I did it anyway. But I’m glad I did, as it was delicious and true to 1950’s float specifications. Because here she is, exhausted as all get out, annoyed with the aforementioned rambunctious three-year-old, just wanting to get home – still 40 minutes away mind you – with no make-up, no wardrobe, and no care taken for her hair. Yet, to me, still the most beautiful woman in the world. I sometimes prefer these candid no make-up pictures of her. This is the woman I wake up with every day, and I love every inch of her as-is. So there you go. 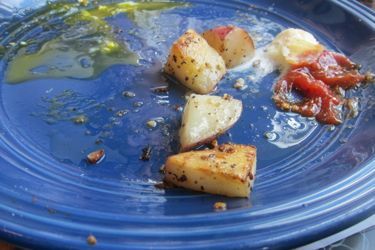 A sappy love-letter to my wife on a page about a diner in North Windham – a page she’ll never read, by the way.